013 | Girl Meets Parisien Glass | [Interview] Locaux! Who, What, Where is Locaux? It was four years ago, during a crossroad in life, that Chicago native Tanisha Townsend landed the opportunity live in the city she had come to adore: Paris. Given she had previously fallen for the City of Lights, combined with the timing of being laid off from her corporate gig, becoming newly single and being offered to guest lecturer post, all proved a bit of destiny to start anew. And start anew, she did. In this episode, Tanisha shares why Paris is home, how she’s managed becoming a legal resident and the genesis of Girl Meets Glass. Listen and enjoy this story of serendipity, learn about cute spots to enjoy great adult beverages of wine or a great gin & tonic, and where you can book a lovely tour to Champagne and more. Note: Citizens of the U.S. can visit France, or any other country within the European Union for up to 90 days within a 180-day period. 3.1 Get Locaux! Share your story here. • Learn which long-stay visa Tanisha acquired live in Paris. • Best local spots for delish eats and a glass of wine or two or …. • Hear which cocktail bar has the best G&T. • Suggestions of quick and easy day trips from Paris. • Her favorite wine tour of Champagne. In the heart of Paris is Holybelly the lovingly unconventional Melbourne-Style café, inspired by the time the owners (Sarah Mouchot and Nico Alary) living down under. Hollybelly dishes up a menu of fresh seasonal fare. The coffe, delicious, with a reputation for being a bit pricey. The owners express thay take great care from bean purchase, to using reverse-osmosis that is perfectly measured to produce the perfect cup o’ java. English speaking patrons may love the owners have made the deliberate choice of creating an environment that welcomes Anglophones. They cite “everyone speaks [English] and the ones who don’t can only blame themselves for it. It’s 2018, we travel, we interact and limiting Holybelly’s voice to the border of our tiny country would be a shame’. Hollybelly is one place Tanisha enjoys having breakfast, as the food and environment are reminiscent of her former ‘home’. I suspect the English-speaking environment comforts this American expat. With its striking and yet relaxing view, A. Lacroix offers a fresh selection of homemade pastries prepared in-house in their open kitchen for you to indulge. You’d be remiss to overlook having a cup or two of fresh ground, locally roasted coffee or a spot of ethically sourced teas. At A. Lacoix, you’re invited it eat in, or order to-go. The Twenty Hours Wine Suite, a cellar, wine bar and restaurant. The warm environment welcomes you purchase to-go or dine in with friends, or book for private events. All our dishes can be accompanied by the bottle of your choice or a selection of wines by the glass to taste several. Dine from a simple, yet select menu of the best Corsican and Spanish cured meats, salads, carpaccio, foie gras, toasted Mont d’Or, roasted camembert, in addition too cheeses from small-batch producers and homemade desserts that are made to complement and highlight their carefully chosen wines; ninety-percent of which come direct from vinyard’s cellar. Tucked along rue de Belleville is the buzz-worthy ‘little bar that could and did’: Combat – an all-female bar team serving what owners Elena Schmitt and Margot Lecarpentier (formerly of Experimental Cocktail Club) describe as a “sustainable, homemade menu” of cocktails and tapas-style bar eats. Combat serves a niche, yet satisfying selection of natural wines, craft beers and a panel of homemade products in an eco-friendly manner. Their signature cocktails are made with in-house fresh pressed juices syrups, and tonics created in a sustainable way. Though the cocktails are rated as having note-worthy, they are priced to convey originality created by unexpected combinations such as gin infused with pastis eucalyptus, or a mix of Suze aperitif and smoked whisky. Two of their cocktails contain vinegar – elderflower and apple. With its dark-gray façade, whitewashed stonewalls, a green boudoir, vintage furniture, and white marble table trays and sidewalk terrace, Combat displays an understated relaxed French elegance that has seamlessly integrated into the décor of this eastern district in Paris, as if it were there prior to 2010. Though the ladies present a menu of small plates to dine on while enjoying your adult beverage, you’re visiting Combat for their craft cocktails. 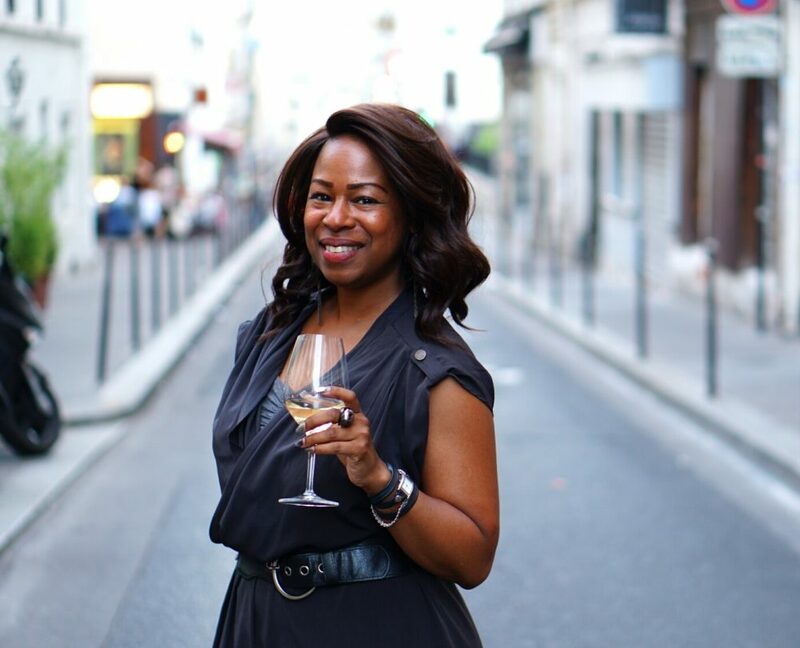 Read the complete list of Tanisha’s favorite places to eat, drink, shop snd stroll around Paris here. Tune in to hear stories of other fab women on episodes page. And while you’re there, subscribe to get the latest podcast. Listen to Locaux!, The Podcast. We’re celebrating the stories of phenomenally unconventional single women entrepreneurs who have followed a strong pull to upsticks from their country of origin, unearth a patch of land and plants seeds where their soul feels most at home. They are well-traveled women who have found clever ways to move countries and you can too! So, join us, as we travel through the their minds of those who have dard greatly, giving into their obsessions and actually live, abroad. If you have a story, let us know! We look forward to sharing the stories of fab women like you. So yah, get in touch here to have your story, or that of another awesome woman featured on the show. And while you’re there, subscribe to get the latest podcast. Are you or someone you know a phenomenally unconventional woman entrepreneur that is now an expat? If so, submit to Locaux! The Podcast. Get Locaux! Share your story here. Discover hidden city gems perusing our insider guides. The women in our Locaux + Collectifs share local’s perspective on who, what and where when visiting cities around the world! Also, check the latest walking tour in the Walk It! Locaux series. If you have intimate knowledge of a city, becomes a contributor! Spread the love of Locaux!